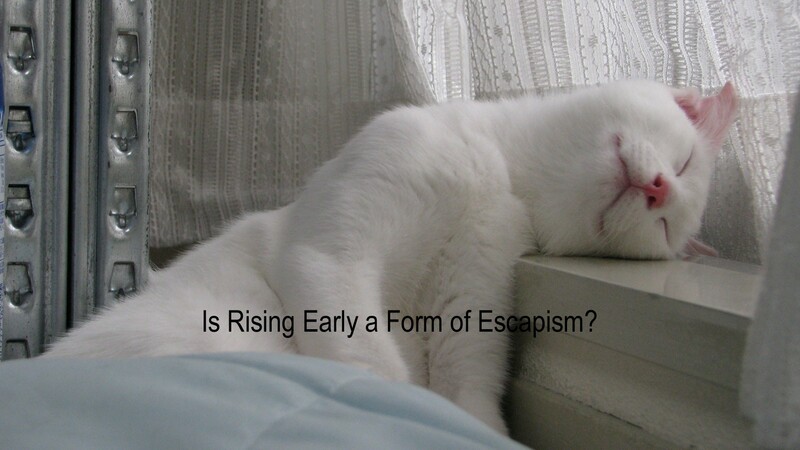 Is Rising Early a Form of Escapism? Everybody and their mom is talking about the huge benefits of rising early. Me too. Well it’s all true. You can greet the sun and be alone and do the work of the entire day in three hours if you wake at 5AM. Everyone who is not rising early is blown away if you tell them that you get up 4:30AM. I know I tried. They think to themselves that you are either amazing or insane or both. They may admire you or think you should get a life. They are right. But wait, there has to be some trick here. I does not matter how long you sleep, 6 hours, 8 hours, whatever. If the time for rising early corresponds to similar early time to bed then the waking time is the same. Where does the time come from?! Let’s say that 8 hours is a good time for a nights sleep. So, if you want to be amazing and wake at 4:30AM then you should go to bed 8:30PM. Well… as you can probably guess the 8:30PM bed time is the problem not when you wake up. You get the most important and energetic time shortly after waking to yourself and your most important tasks. But this is only true if you have things you have to do in the morning. Going to work 9AM, take the kids to school 8AM. That probably covers 80% of working adults most effective time. If we look at the person who does not have the morning responsibilities then it really does not matter when she gets up. There is no real difference if you take the three hours from 5 to 8AM or the ones from 8 to 11AM as your personal quiet and productivity time. Well, that is not really true, there’s probably a peak performance time for everybody and you should time your sleeping schedule to get your first waking hours on that period of time. Most of my young adulthood I got to bed around the time the early risers get up. I slept till noon and it was great. I considered 8AM chicken o clock in the morning. By my early 30s I had developed a more rigid schedule waking and getting to work like most people. Then I stumbled upon the idea of waking early and decided to try it. What I found out during my experiments was that I usually wake up 7 to 8 hour after I fall a sleep. Sure enough, if I get to bed at 9PM I’m up at 5AM. I also discovered that it is relatively easy for me to change the time when the sleeping period occurs. I can adjust my bed time to be anywhere between 9PM and 3AM. So the real key to rising early is misaligning yourself with others. Be antisocial! Avoid people! Escape! Well, it’s true. If you want to avoid distraction you have to avoid distractors, I mean people. Yes, I understand that most people have the morning responsibilities that cut your day in pieces and in that case rising early is the best solution. But you pay for that time with the time you take off from interacting with regular folks in the evening. So, there, that’s how I feel about this. What do you think? Night Owls Smarter: A New Study Suggests That Late-To-Bed-Late-To-Rise Leads To Greater Workplace Success, Medical Daily. Though outliers such as former U.S. President George W. Bush, Thomas Edison and Ernest Hemingway achieved phenomenal success as early risers, such people on average tend to make good civil servants and accountants, whereas later risers tend to demonstrate traits linked to greater occupational success and higher incomes. Originally published at Fix Willpower. Ideas and tactics on how to improve your willpower. Willpower is the key to the results you want. More willpower will lead you to a healthier and happier life.